Go NaNoPloblano (National Blog Posting Month) (https://cheerpeppers.wordpress.com/) ! And day 2 of 30 Days of Thankfulness (https://mcclendonvilla.wordpress.com/2016/10/29/30-days-of-thankfulness/). This is James Bay – the neighbourhood in Victoria, BC, Canada where I, Kevin, and our 3 kitties currently live. I thought I would blog about James Bay today for the NaNoPoblano challenge to get away from other things going on for me right now. A bit of an escape, if you will. Over the course of the next while, my plan is to show you around the neighbourhood, to introduce you to some of the more well-known spots, and to point out some not-so-well-known, hidden gems. But first, a little about James Bay! According to Wikipedia (and other sources) (https://en.wikipedia.org/wiki/James_Bay,_Greater_Victoria), James Bay is “the oldest residential neighbourhood on the west coast of North America that is north of San Fransisco.” I don’t know. Seems like they are stretching for a “most something” point there, but it is an old neighbourhood for a city in Western Canada, anyway. As I post over the next while, I’ll talk a bit more about the history of James Bay, from being the home to the Lekwungen people of the Coast Salish, to becoming home to the provincial legislature and to some of the city’s elite, to becoming a hub of industry, to a place where people finally awoke to the mass destruction of heritage houses to put up huge apartment buildings giving “rise to a grassroots heritage preservation effort” (Wikipedia article). What I will tell you about our neighbourhood now is that it’s tourist central for Victoria. 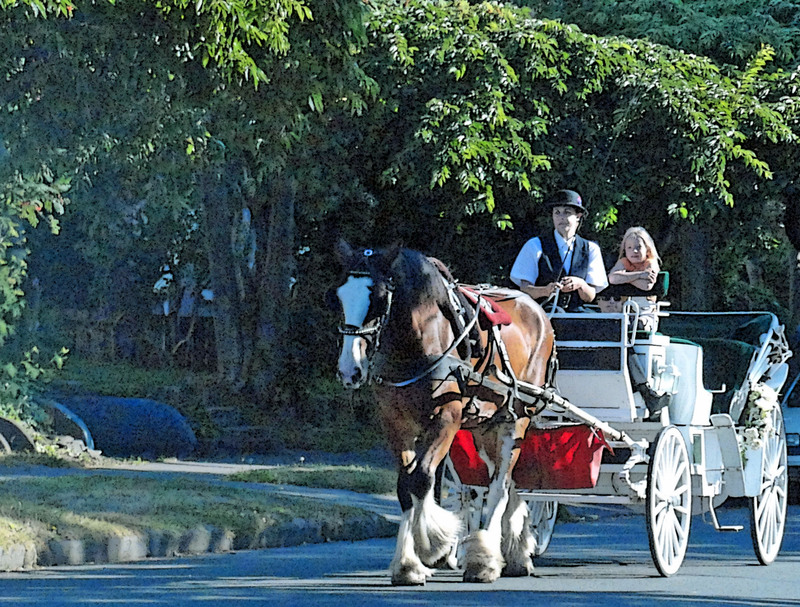 Close to downtown, home to the cruise ship docks, even the horse and carriages go down our street. It’s a vibrant, lively, beautiful place to call home – and I am grateful for living here! Hey, apparently we even need to watch out for zombies! So, stay tuned for more about James Bay!